LA Garden Blog : Fresh Mulch Daily! Well, not daily, but we did have fresh compost/mulch delivered today (21 October) and expect another load next Wednesday! We get this from the city of Los Angeles. Though it smells as though it ought to have manure in it, that's just the smell of decomposition - this is nothing more than Los Angeles green can waste, sorted to remove trash and non-compostable items, ground up to a finer texture and set to compost for an interval of time (depending on temperature etc the amount of time can vary considerably). 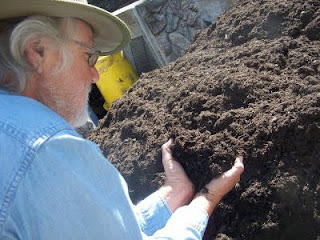 The compost is turned at least once in this process and may be sifted again as well. When it arrives here, the pieces are still somewhat discernible - you can tell the bits that were leaves although it can be hard to identify species of tree a given leaf is from. I like chunks like this - it will take longer to break down and the way I use this stuff is to spread it on top of my soil as a mulch, to feed the soil biota; because it is chunkier, it will take longer to break down. So this is perfect stuff for me. I like to see it go on 4" deep or more, depending on the plant. In my experimental plots, I've not used any fertilizer in about six years and we are still getting super yields. We have mulched and mulched - this compost and wood chips have been used by the barrow full and the soil is as lovely as any garden could hope for. We are moving this experience out into the rest of the Garden and getting beyond the cycle of fertilizer leading to low fertility necessitating more fertilizer ad nauseum. Our fertility stays in our Garden (rather than being washed away) because it is a natural biological process and not something added as a powder or a liquid. Our fertility is in the bodies of the critters of the soil and doesn't become run off that pollutes our waterways or ground water. I was thinking this morning how wonderful this life is when I can make a phone call and 48 hours later, a big truck pulls up and dumps 30 cubic yards of compost for my garden for free and they'll do it again next week! Truly this is a precious resource from the Los Angeles Department of Sanitation. One reason The Learning Garden continues to get such quantities of this stuff is because we give it away to other sites(i.e. local residents, schools, shelters and half-way houses with gardens) that don't have a storage area like our little alley. You can pick up this material from us, or from one of several yards around the LA area for free - as much as you want as often as you can! I am very grateful to Pete Robinson and the Los Angeles Department of Sanitation and this compost project! Without this material, The Learning Garden wouldn't be half of what it is today. Someone Is Being A Little Optimistic! !